Woohoo, guess what I finished last night (well, early EARLY this morning)? The first half of my first real design! 🙂 That’s fun to say. I love it, all that tinking was worth it. It’s a tiny bit tight on my forearm because I have rather large arms, but I was NOT about to frog the whole thing back and start over… again. I’m going to just go with ‘my arms will shrink soon’ and really, nobody wants a loose armwarmer anyway. But seriously, how pretty is that ribbon? When I saw the color of the yarn in person (Zaftig, Fierce Snake) it made me think of ribbons and lace and corsets and Victorian things. Thus, this gauntlet/wristwarmer/whatever was born. 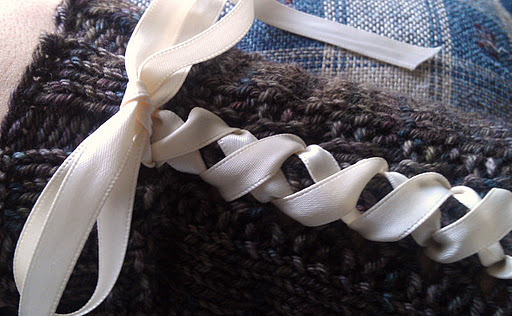 It would be pretty simple to de-ribbon it, too, if you didn’t want the extra prettiness. More pics when I write it up and publish it. 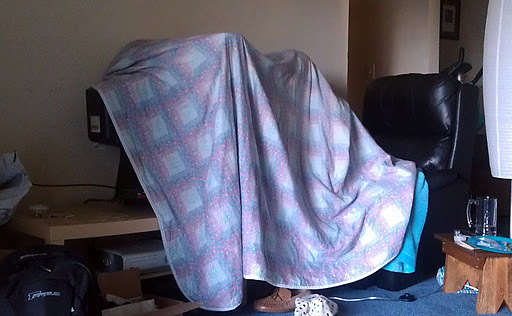 That’s my Fiasco, with his new video game, huddled under blankets hiding from the light of day so he can see the TV screen better. Despite the vast amounts of yarn I buy and how much I talk about knitting, I don’t think I’ve ever looked quite this silly. This entry was posted in MyDesigns, silliness by shoelaceswitcher. Bookmark the permalink. Yes, knitters will definitely never look that silly LOL!!!!! In fact we need the light of day to see our pretty yarnz!!!! I am madly in love with the sneak peek of your design. I know just who to gift it to. LOL on your Fiasco's blanket. That ribbon is just gorgeous!! Can't wait to see the final project! And that picture is priceless. Just. priceless. I know, right! And he played like that for quite a while. Thank you, Eleanor! *blushes* The pattern should be available on Ravelry shortly. Thanks, Carrie! I'm planning to keep that picture forever for future blackmail purposes. He's going to be a teacher someday, his students would kill for material like that.